Living Beneath the Colorado Peaks: The Story of Knapp Ranch is a gorgeous new coffee table book that shows readers why embracing sustainability practices — traditional methods and new technology — pays off in the lives of present-day individuals and future generations. VAIL VALLEY, Colo., September 17, 2018 – Betsy and Bud Knapp, former owners of Architectural Digest and Bon Appetit magazines, have released a new book titled Living Beneath the Colorado Peaks: The Story of Knapp Ranch, detailing how the couple researched and applied sustainable practices across a variety of environmental disciplines. These areas of exploration include high yield farming at 9,000 feet, fostering biodiversity through land, water and forest management and climate change science. Guided by principles of responsible land stewardship, the Knapps were able to create a successful farm at a challenging elevation. Knapp Ranch employs a combination of old-world methods such as using organic farming practices with 21st-century technology, like weather monitoring stations, to produce within the framework of small-scale agriculture. “One hundred years ago, homesteads were sustainable because they had to be. And they were carbon neutral. Today we want to return to our roots and employ the latest scientific advancements to make greater sustainability possible,” Betsy Knapp said. 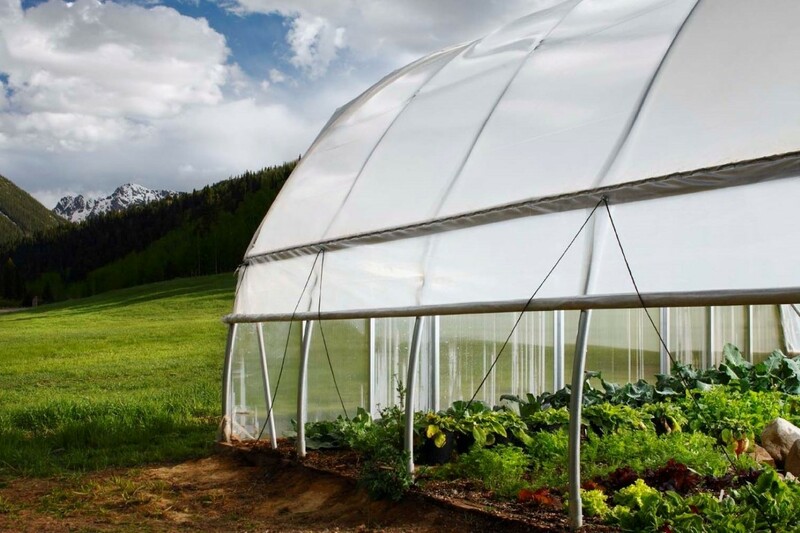 Betsy and Bud's vision to live and farm sustainably high up in the Rockies is a testament to not only love of the land and its history, but to the future of high altitude research and agriculture. Other sustainable practices at the ranch include water conservation and stewardship. A lake on the property offers much more than a pretty view. It is also critical to the ranch’s water infrastructure and helps the ranch prepare for fluctuations in water availability, provides water for domestic and agricultural use, as well as for fire protection; the Knapps return all but a small portion of the water back to the creek, ensuring water availability for downstream users. The Knapps are also vigilant about water stewardship and maintaining the natural hydrologic cycle for optimal lake and stream habitat. Another way the ranch implements sustainability practices is through its alliances with government agencies and academic collaborations. It works with the U.S. Forest Service to remove diseased trees to sell as timber and an on-site sawmill recycles some of the wood into furniture. Forest regeneration and diversification efforts include replanting indigenous Douglas firs and other native plant species throughout the property. A collaboration with Wellesley College Botanic Gardens is conducting ongoing experiments with biological communities required to support productive agriculture. In addition to agricultural research, the farm grows vegetables, flowers, herbs, microgreens and native wildflower honey. Living Beneath the Colorado Peaks: The Story of Knapp Ranch teaches and inspires readers to share in a growing body of evidence that supports practical applications of sustainable practices through organic food production, water conservation, climate change science, best land use practices and environmental education. Author Sarah Chase Shaw is a landscape architect and an Aspen-based freelance writer whose expertise includes landscape architecture, land planning and design in the American West. She is the author of two previous books on those subjects. The Knapp Ranch book features the photography of Todd Winslow Pierce, a Vail-based award-winning landscape and fine art photographer whose images have appeared in national and regional publications, advertisements and fine art galleries. Living Beneath the Colorado Peaks: The Story of Knapp Ranch is an 11” x 13” hardcover book with 288 pages and over 200 photographs, drawings, maps, historical pictures and an index. Retail price, $70. ISBN 978-1-4236-5096-6. It will be available for sale beginning Sept. 11, at Gibbs Smith, www.KnappRanch.com and at online sellers, independent bookstores and other quality retail outlets. Knapp Ranch is situated in the Vail Valley of Colorado. Its owners, Betsy and Bud Knapp fell in love with the property on first sight. As their knowledge of and affection for the land grew, the Knapps expanded their vision beyond building an informal country retreat for family and friends. Twenty-five years in the making, Knapp Ranch is now a thriving working farm using sustainable practices; it is an exemplar for land management and water conservation, an inspiration for architectural design and traditional craftsmanship, a contributor to climate science studies, a lab for horticultural experimentation, a US Forest Service partner, an educational center for environmental studies of all kinds and it continues to evolve. Encouraged by friends and professionals to document their journey and share their knowledge with others, the result is Living Beneath the Colorado Peaks: The Story of Knapp Ranch. Gibbs Smith is a Utah-based publisher, founded in 1969. Its trade and special interest division publishes high-end quality products on a variety of subjects including non-fiction, home and design, cooking, regional titles, as well as distribute for select publishers. Additional information about the book is available at www.gibbssmith.com and www.KnappRanch.com. Karin Gamba, Resort Trends, Inc. Patsy Popejoy, Resort Trends, Inc.